Software competency will provide an edge and open further opportunities for the service providers. As more automobiles connect, software competency will provide an edge and open further opportunities for the service providers. NITI Aayog or the National Institution for Transforming India-the Government of India’s policy think-tank-predicted last year that the urbanization rate in the country would increase to over 60 per cent in the next 30 years, assuming 7-9 per cent rate of economic growth. Further, another report by McKinsey Global Institute (MGI) states that urban expansion would be such that, by the year 2030 five cities from India would have economies as large as some of the middle-income countries today. This surge in urban GDP and the concomitant rise in jobs creation would see unprecedented and almost unrestrained migration of people into cities. To make the growing settlements liveable, workable and sustainable, cities have to focus on solving the dual issues of vehicular traffic and climate change along with providing affordable housing and quality education. A report by the erstwhile Planning Commission on the 12th Plan confirms that very few Indian cities have 2030 master plans that take into account some of these areas. However, it is encouraging to note that urban reforms at the municipal and state level have started to take form with long term sustainability goals in perspective. Transportation, which not only is the lifeline of a city, but also has impact on our ecology, should be addressed with utmost priority. If data is anything to go by, 45 out of 60 selected (i.e. 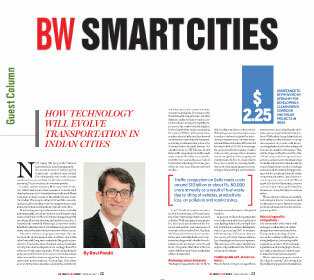 75 per cent) Indian smart cities have set their focus on upgrading their transportation systems through use of technology. This comes as no surprise when one takes a look at the statistics in some key areas such as environment, economics and safety. For instance, the World Health Organization (WHO) database indicates that seventeen cities in India are among the top fifty cities across the world with the highest levels of particulate matter measuring 10 microns (PM10). At the same time, road accident deaths in cities showed an increase of 9 per cent over four years, according to national data released by National Crime Records Bureau. Yet another study by IIT Madras found that traffic congestion on Delhi roads costs around $10 billion or about Rs. 60,000 crore annually as a result of fuel waste due to idling of vehicles, productivity loss, air pollution and road crashes. I can’t think of another country in which technology will leapfrog to transform city transportation as much as India. With changing demographics, increased penetration of the Internet and mobile, and emergence of concepts such as hybrid fuel, big data, M2M (machine-to-machine connectivity), and embedded software in automotive, the ground is fertile for technological advancements to breed and thrive. The points that follow reflect on some of the key areas where technology will see a major play. The huge increase of vehicular traffic in cities is a big contributor to the toxic air. While the government has taken steps to reduce carbon footprint by introducing measures such as Faster Adoption and Manufacturing of Hybrid and Electric Vehicles (FAME) to encourage the adoption of fuel economy vehicles in the country, proposed new emission norms and policies for scrapping old commercial vehicles etc., it is pertinent for us as a country to also keep the focus on developing homegrown technologies that are frugal, environment-friendly and can be taken to the global markets. At present, India is doing extensive work in the areas of electric and hybrid cars, hydrogen fuel cells, multiple battery technologies, and also finding new ways of generating CNG to mitigate CO2 emissions. CNG, as an alternative source of fuel for transportation, has already gained mass acceptance. This also provides opportunities for engineering solutions in the field of alternate powertrains. We are fast moving to an age where autonomous cars, including the driverless, are no longer whimsical innovations. While a lot is being debated about their safety and feasibility in running on congested city roads, with broadened regulation and further advanced features the market will mature. This will be triggered by the growth of the ADAS (advanced driving assistance systems) and sensor technologies that make the autonomous vehicle safer by supporting features such as parking assistance, alert systems for approaching vehicles, people and objects, traffic congestion assistance, lane departure warning and cruise control. When applied to their full potential, sensors can even surpass the capabilities of the human eye using 360 degree camera vision. We are already working on multiple technologies for our customers and see this space to grow further with our profound domain knowledge and engineering skills. The automobiles of the future will no longer work in silos but rather designed as connected machines. Transportation strategy of cities across the world are shifting due to rising fuel prices, increasing traffic congestion, and new CO2 emissions legislations and leveraging technologies such as big data and mobile apps to make their operations smarter. What is also emerging as a trend is the “shared economy”, driven hugely by the millennial population that believes in renting assets rather than buying. The impact of this has been significant on car ownerships too, with the commuter giving preference to hailing an app-based taxi or riding the metro rail than self-driving. This calls for improved collaboration between auto manufacturers, fleet operators, technology and wireless service providers to create multi-modal transport systems that assist in achieving last mile connectivity. It would also mean greater use of technology that enhance communication and provide passenger convenience. As more automobiles connect, software competency will provide an edge and open further opportunities for the service providers. GPS and cloud-based connected buses, using ITS (Intelligent Transport Systems), are also making their presence in Indian cities, giving passengers the convenience of real-time information on bus locations, schedules, routes etc. at the stops or on smartphones. The investments in the aforementioned areas, however, will be successful only if they integrate with the larger ecosystem. It would mean greater degree of communication between the system and critical services, with Internet of Things (IoT) at the core. What IoT does is internetwork or connect the vehicles with the physical objects (traffic signals, police patrolling vans etc.) to deliver real-time online information about the traffic flow, tracking of the assets, and passengers/commuters. For instance, buses running on intelligent transport systems can significantly improve their response time during an accident through real-time connectivity with bus depots that can despatch the nearest traffic police and medical health providers to the site. This would also require standardization and interoperability of all the software and hardware systems across service providers. The other important aspect to this is how advanced the infrastructure is. Are the supporting systems such as traffic, ticketing and toll collection automated for assisting faster movement of vehicular traffic? Is the city well equipped with charging points to cater to the proportionate rise in electric vehicles that hit the road? It is with questions such as these that cities must approach the overhaul. As much as the adoption of technology, it is imperative to create an environment that fosters greater public-private partnerships models to roll out solutions faster, facilitates closer collaboration between different stakeholders and aims at achieving inclusivity.